Just regular folks. : President's day weekend. After the aborted dental surgery and the Valentine's day party, we immediately packed up the car and headed to upstate NY to visit Kiki and Kappa, via my parent's apartment in New Jersey. In case you missed it, my parents (who are nuclear engineers) were laid off from their jobs in NJ a few weeks ago (which they did accurately predict would happen if Obama was elected since he did not include as part of his platform the building of 45 nuclear reactors by 2030). After they were let go, they moved back to MD, (it's been nice having them around, they get to go to the aborted dental surgeries and the valentine's day parties and we get some wonderful weeknight dinners). They still have a few more weeks left on their NJ apartment lease and we took advantage of free lodging on the way. My parents did warn us that the only thing left in their apartment were 2 twin sized beds. I wondered if we should bring an air mattress or some sort of sleeping bag, but I was overruled. 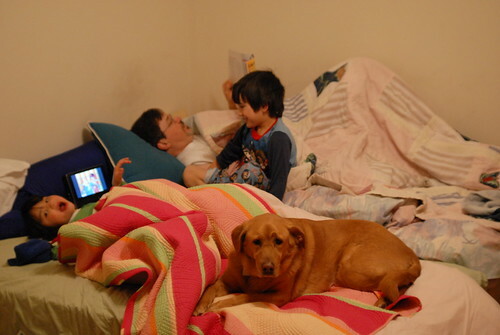 FAMILY BED was the consensus. Was it comfortable? Not really (I had not expected that Ruby would take up 35% of my twin bed). Was it worth not spending the 70 dollars on the Comfort Inn? Questionable. We will head back to Washougal, WA right after Vince's birthday on March 7. Washougal is a suburb of Portland, OR. The place is only 18 miles away from the Portland International Airport along the northern shore of the Columbia River. We will stay there during our summer and autumn time at least. Certainly, Rena and I are going to miss Doris & her gangs here. But, we hope we can spend more time with Donald and enjoy my forced retirement. Not Rena's though, she loves not working. Forced or not, we will enjoy ourselves there along the River, or anywhere.